At last, a moment to upload a couple more photographs from our trip to Drottningholm in Sweden. Apologies for the slightly wonky photography here, but I was thoroughly soaked by driving rain and was snapping them with one hand while I held an umbrella with the other! 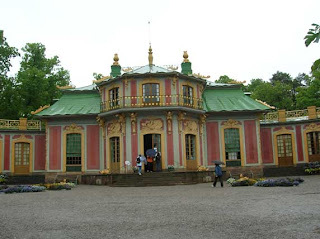 Anyhow, the Chinese Pavilion (Kina Slott, top) - like the Drottningholm Court Theatre - can be found in the grounds of the Palace and was built by King Adolf Fredrik as a present for Queen Lovisa Ulrika on her birthday in 1753. I wished I could have taken some photographs inside because it was stunning. All the rooms were different colours and gave a very intimate and playful picture of royal life (just to give you some idea, there's a picture here of The Green Drawing Room). 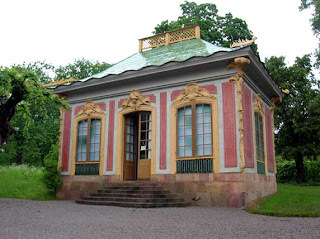 You can see from the buildings (below is The Billard Room, completed at the end of the 1760s) that it's very much an 18th-century notion of Chinese style, which looks slightly strange to us now. The Chinese did not use dragons as ornaments, and the bells hanging from the buildings were very much a feature of European chinoiserie. But I adored the lavish decoration in places such as The Mirrored Drawing Room, and also The Red Room, which looked like a lacquered Chinese box... Exquisite! That looks lovely! The chinoiserie actually reminds me of the amusement parks we have in Canada--that's basically how China is depicted here! Thanks Eliza - hope all's well! I hope you didn't miss the "confidence" -the diningroom pavilion just above the café...where the royal family and their intimates could dine in private. The tables would be set in the basement at kitchen level and then sent up with ropes and pullies. It's a gorgeous room were i could kill to give a dinnerparty! Hi Tutta Rolf, I'm ashamed to say that we did miss it - we were under time pressure to get back for the start of the opera. But I bought the book about the Chinese Pavilion and was reading about it the other day and kicked myself for not seeing the Confidence. We're agreed that we just have to go back next year and leave plenty of time to explore!